Is there a place where I can download the Playstation version, or do I need to compile the source and build a disc image? It works on a PS2 with Modchip but he video mode is fixed to the console's region, due to the PS2 design. has anyone ever considered porting this to MS-DOS? or is there something similar out there for DOS PCs already? SO has anyone noticed that their PVMs have different geometry on 240p vs 480i? I used the test suite in 240p and got the geometry right. For my NES it looks good and my SNES, but then I switch to GCN and PS2 and it looks off in the same direction that i moved the geometry in the grid pattern. I then corrected it using the 480i mode, but when I switched it back to 240p everything was shifted back to the right as it had been before. 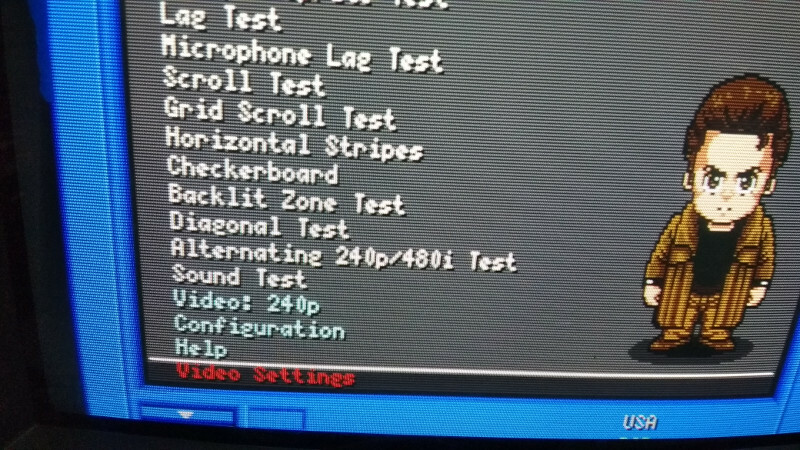 BTW I'm using a Dreamcast on composite video to test geometry. I know its not the best but its all i have to work with until my SD Media Launcher comes in. Every console on every resolution can be/is slightly different. But shouldn't the video modes on the dreamcast version all have the same horizontal position? "480i scaled 240p assets (NTSC)" displays the grid in the correct position (for dreamcast games). 240p video mode is right shifted. Which version are you using? I recall I did a test for somebody and it might have slipped by. Sorry for the inconvenience, I just checked and see what you mean. The current configuration for 240p was indeed crafted by myself, several years ago. 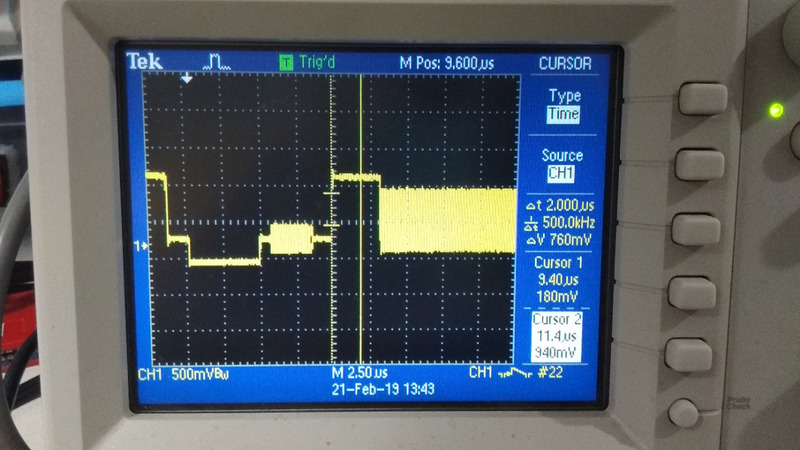 Based off the defaults of the SDK and measurements, but I can't find my notes on this specific version. 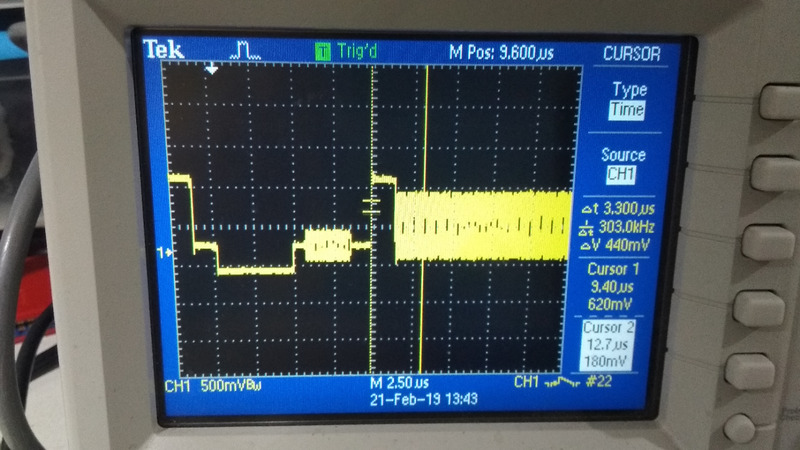 It might be the case I didn't have an oscilloscope when I coded it, and never compared it back against the configurations used by games as I have done with all the others. Right now I won't have time to compare it, but will have time this week. Since this is a community effort and it benefits a lot from it, here's what we can do. It has a Video Settings sub menu, that allows you to change all the configuration for the video mode. The value you are looking to change is "Bitmap X"
I can compare that to the game that comes to mind, Third Strike on the scope after a while. But meanwhile you can try it out and give me the estimate value you find to work for you. Then we can talk about value sin several games, since the DC allows each game to define this. And if itis necessary we can add an option for one or more defaults under Configuration/settings. Adjusting the video settings in this debug version and "pressing Y to set" has no effect. But the default settings in this debug version are correct. The horizontal position of the grid in "240p" video mode is good (although the vertical position is shifted down). 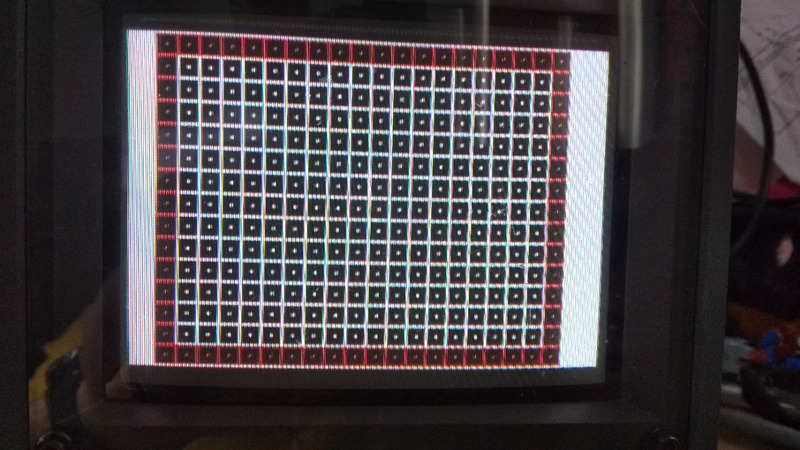 In "480i scaled 240p assets (NTSC)" video mode the grid position is correct both vertically and horizontally. I also want to mention that the pc engine version (1.03) grids are all shifted up slightly, and shifted too far down when using "start at line: 24". The 320x240 and 512x240 grids are shifted left. Thanks for the feedback, I already changed the value to the proposed one. And here is a test version with it as default: https://www.dropbox.com/s/w7o82jc8220rp ... 4.zip?dl=0 (same link as above). 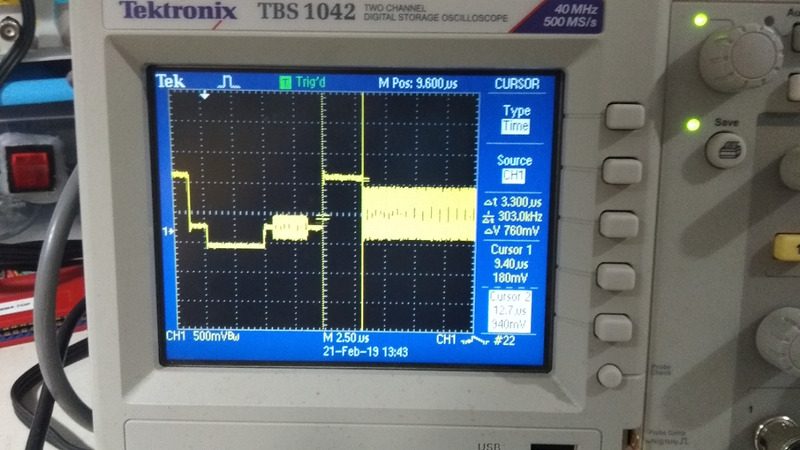 This time "Y to Set" should work, sorry about that (left something commented). I'll wait for your feedback before pushing these changes. They were indeed introduced as an error for some testing I had been asked for, and forgot to revert them. That is really strange. I copied the values from game registers. I remember I tested a few dozen games with those values, I remember Final Soldier specifically since it was years ago. Do you have any examples? I tested the Dreamcast debug version from the dropbox link above and the grids (and other test patterns) all look good in both 240p and 480i scaled video modes. 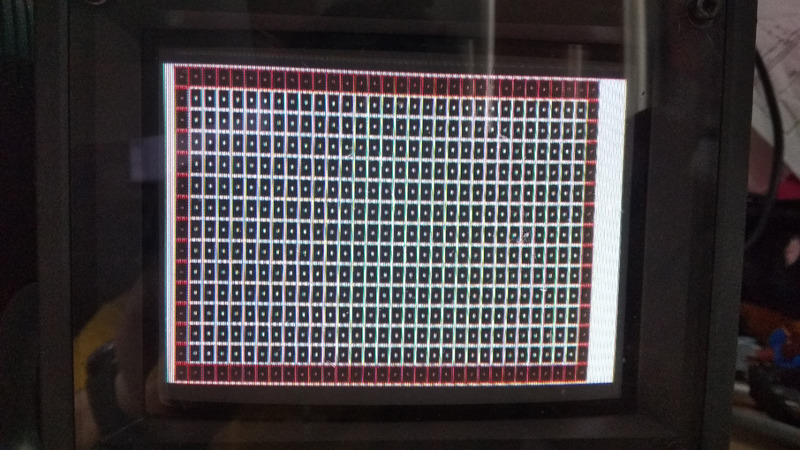 The vertical position of the grids in the PC Engine test suite matches the vertical position of the grids in the Dreamcast test suite. However, PC Engine games are positioned down slightly. So if I calibrate my monitor using the PC Engine test suite grid, when I start a game there is a black bar at the top of the image. Final Soldier, PC Genjin, Fantasy Zone, Jigoku Meguri, Star Paroja, Nexzr, maybe a few others that I forgot. Saigo no Nindou was the only game I found to be different. 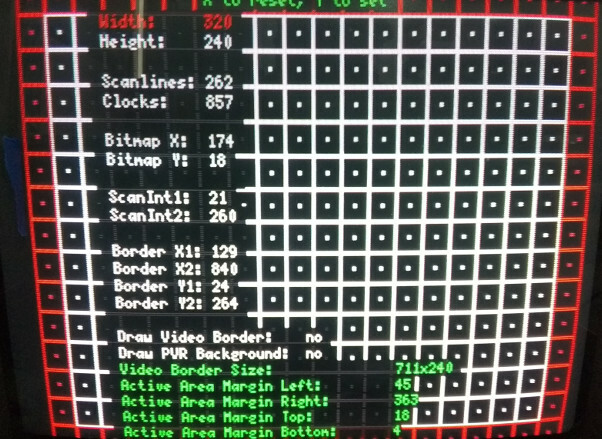 Compared to the games above, in 240p video mode (start at line 22), grids 256x240 and 320x240 are shifted up (linearity patterns as well), and grid 512x240 is shifted up and to the left. In 224p mode (start at line 22), grid 512x224 is shifted left. 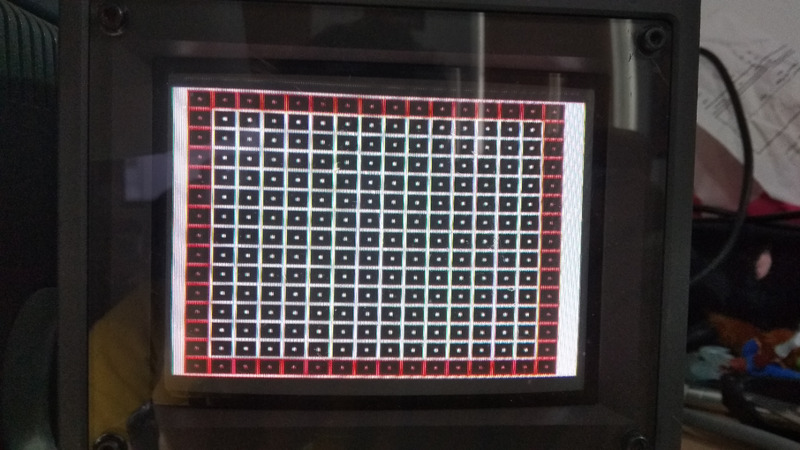 In 240p mode (start at line 24), grids 256x240 and 320x240 are shifted down (linearity 320x240 looks good) and grid 512x240 is shifted down and left. 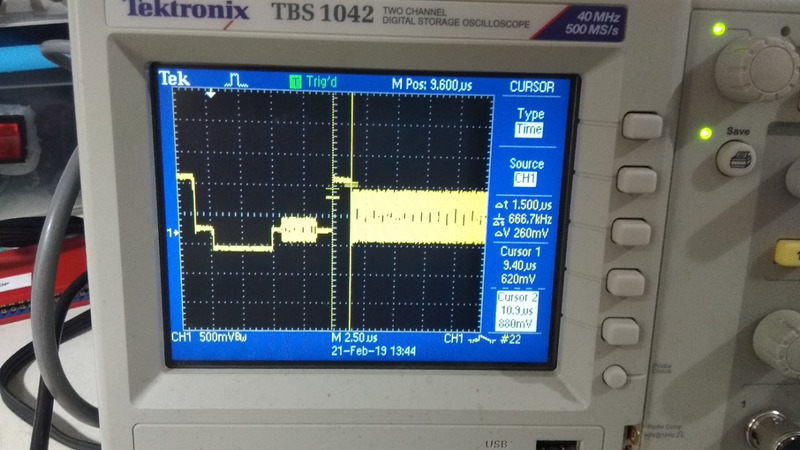 Sorry it's been a while, but aside from being way too busy with regular chores and some pcb repairs, I wanted to do serious testing and figure out what is happening. Excellent! I'll make a small change and release it soon. Thank you very much. Yes, each system varies slightly. Thanks for your detailed input. I started by checking how those games set the registers, and everything matched the use in the Suite. Of course most of them are 256x239. There is nothing I know of in the catalogue that uses 320x240 or 512x240. Irem games like Ninja Spirit use different configurations to those used by NEC and Hudson (I might look a bit into those), and Fantasy Zone is also different form the rest, since it uses 224p but with some blank lines but is covered by the base 224 setting. 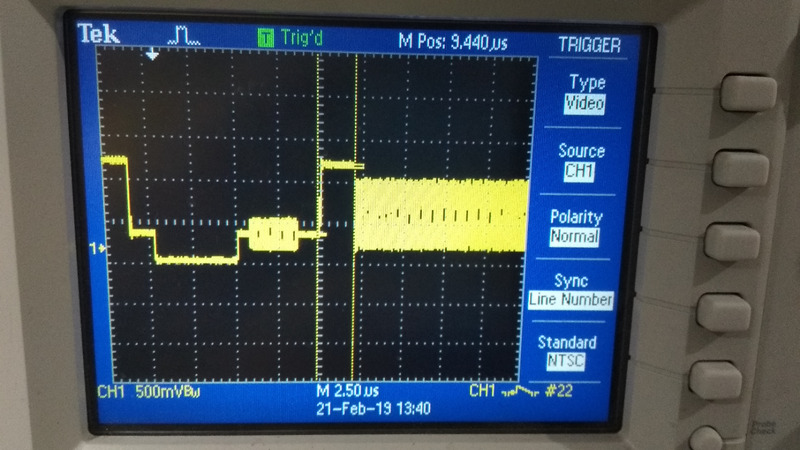 One thing that you might not have used is the "fill all the video signal background area" option while in the Grid patterns, it fills with a white background the full video signal by pressing button I while in the grid. Using that and comparing the values I figured out the differences. 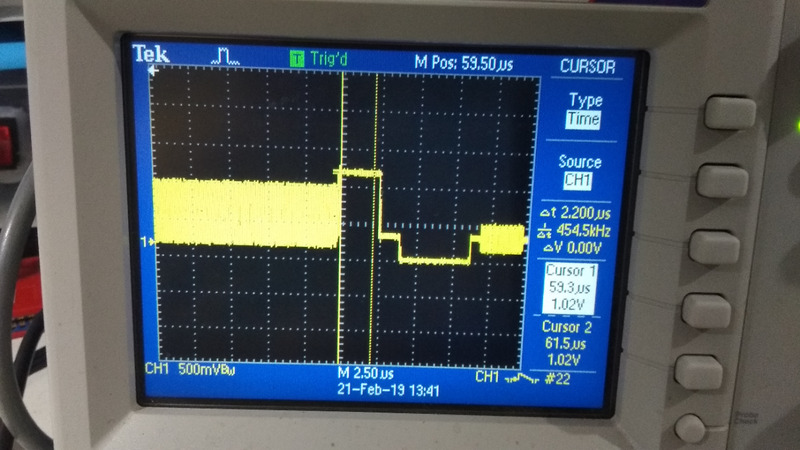 Turns out that HUC - the SDK I am using - has some bad defaults that messed up the signal, and I relied on it after my settings. I shouldn't have done that. I rewrote the resolution management to be completely internal and not relying on HUC defaults, so values can be tweaked to match the NEC/Hudson defaults. Here is 512 before adjusting it, with the HUC defaults and compared to 320. I ended up comparing to R-Type, since it uses 352x240. I also added a Grid and Checkerboard with the R-TYpe resolution, among a lot other things that I'll document when releasing this beta. There is nothing I know of in the catalogue that uses 320x240 or 512x240. I see. If that's the case then I suppose those other grids aren't too important? I thought TwinBee might be 320x240 because the black bars on the side but maybe that's also 256x239. It's the only game I have with that resolution that I can think of at the moment. I checked out the SuperCDROM version of 1.05 and everything looks good. The 320x240 and Rtype grids are slightly shifted left and the 512x240 grid shifted right. But if I am following you correctly, that is how the system outputs those resolutions. I see. If that's the case then I suppose those other grids aren't too important? They are a reference, as any other. I thought TwinBee might be 320x240 because the black bars on the side but maybe that's also 256x239. It's the only game I have with that resolution that I can think of at the moment. They are in 512x240, that's why. I'll make one small change to the suite before releasing this version. Not for a few months, I hope to restart work on the Suite later this year. Sorry. It was a configuration oversight all along. Not64 was updated. 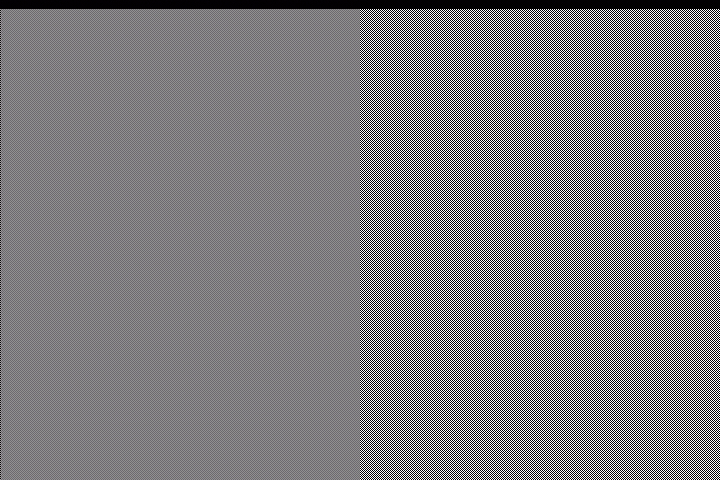 Set "VideoWidth = 0" for pixel perfect. An update for Enhanced mGBA is in the works. On the left is what all versions of the Revolution SDK does. libogc also happen to use decompiled Revolution SDK code. Every piece of software ever released on the Wii that supports 480p is affected. Will other versions get Pluge Contrast soon? If not, I'll be pushing out a new version of the NES, GB, and GBA ports.